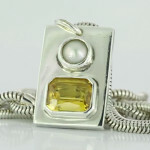 Gaj Kesari Yogh Silver Pendant consist of very fine Em Cut Golden Yellow Sapphire and A real sea salt water Pearl set in Silver bespoke design Pendant for name, fame self contentment, status, prestige, knowledge, wisdom, honour, peace of mind, creativity, recognition, appreciation, be on the track, rise in luck, achievements, progress, promotion and family happiness specially if your Lagna is Cancer, Scorpio & Pisces. Specially recommended for those people who are taking professional qualification or professional qualified but still going through struggle or getting nowhere. Try this Pendant and you will surely ”Discover the Difference” and experience the highest benchmarked quality standard in the industry.